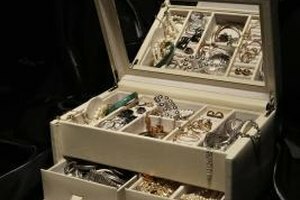 Store fine jewelry in a lined jewelry case. Although fine jewelry benefits from periodic cleaning by a professional jeweler, a regular, at-home cleaning is fast, safe, free of harsh chemicals and costs nearly nothing. Mixed with a dab of gentle soap, fizzy club soda effectively loosens and removes stuck-on grime and smudges that build up over time, restoring the luster and shine to gold jewelry. Club soda even returns the sparkle to precious gemstones such as diamonds, emeralds, sapphires and rubies. Place the jewelry in a tea ball or small strainer so the item isn't accidentally dropped into the drain. Alternatively, wrap the item carefully in muslin or cheesecloth, then tie the top to make a secure pouch. 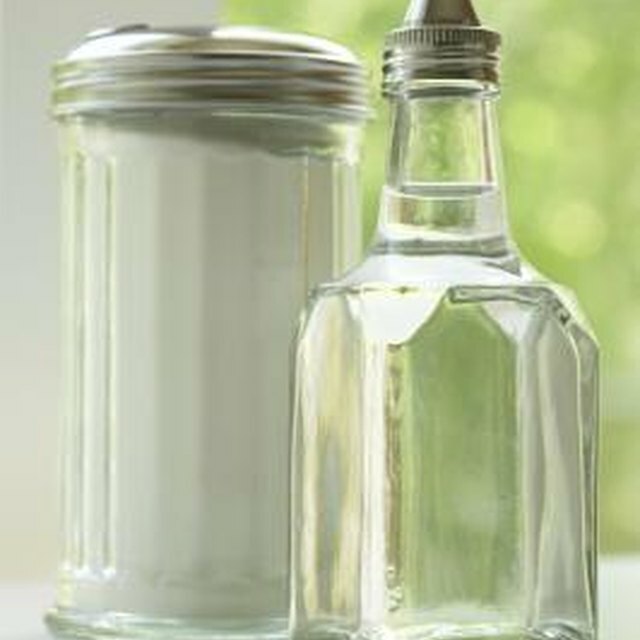 Pour a small amount of sodium-free club soda into a bowl or cup along with one or two drops of gentle liquid dish soap. Make enough solution to immerse the jewelry — along with the strainer — into the solution. Allow the jewelry to soak in the club soda solution for at least five minutes. If the item is badly soiled, soak it overnight. Stir the club soda solution gently to loosen gunk, then remove the jewelry from the liquid. Scrub the jewelry, including the metal setting, gently with a baby toothbrush or soft-bristled brush. Return the jewelry to the strainer, then rinse the piece thoroughly under cool, running water. Remove the jewelry from the strainer, then dry it with a soft, clean cloth. Place the piece upside-down on a soft towel to allow remaining moisture to drain. Don't use dish soap or detergents to clean pearls because harsh substances may damage the surface. Avoid soaking inexpensive costume jewelry because the soda may dissolve the glue that holds the settings. Dip a clean cloth into the liquid instead, then polish the jewelry with the damp cloth.